It’s been seven years since I first made the drive to Indianapolis for the Indy 500. In those years, I’ve come to know Indianapolis as little more than the small town of Speedway, but I’m not complaining. To me, Indy has been an early summer weekend of cookouts, wiffle ball, kegstands & gargoyles, and the occasional 500 miles of Midwestern mayhem. However, this year was different. I took a different route up to Indy; I skipped past the boring wasteland of the interstates crossing eastern Missouri and southern Illinois and I got to Indy a little earlier than usual. With time to spare, I was determined to explore the city and eat somewhere besides the local Buffalo Wild Wings. Of course, the three of us that had arrived early for the weekend had no idea where we should eat. Scouring Urbanspoon & chowhound, I quickly found a few ideas to throw into the discussion. First was the Indianapolis Mecca, St. Elmo Steakhouse. There was also a Cajun restaurant named Y’ats, and one or two other forgettable names. Seeing as I had just driven 700 miles away from the Deep South and Cajun country, I didn’t feel the need to seek out an Indiana version. As for St. Elmo’s, reservations weren’t available until 10:30. It was then that I came across The Loft at The Traders Point Creamery. The name, Traders Point Creamery, sounded vaguely familiar and it garnered a glowing recommendation from our Indy hosts, The LaBuzes. After a few quick clicks on open table, Jon, Gabe, and I began the drive to The Traders Point Creamery. Once we made the remarkably short drive from Speedway to Zionsville, I was surprised by what we found. It was lush greenery as far as the eye could see complete with a decked out old Land Rover for tours and the Traders Point Creamery logo. With that distinctively tan and melancholy cow, I quickly realized where I had heard the name Traders Point Creamery. Their yogurt is sold in Fresh Market and I’ve bought a jar or two of it before. If memory serves me well, it was pretty damn good yogurt. Walking into to Traders Point Creamery, you first pass through the store and then it’s up a flight of stairs to The Loft restaurant. True to its name, it is a converted hayloft. Of course, I don’t know of many haylofts that include a cheese aging room. 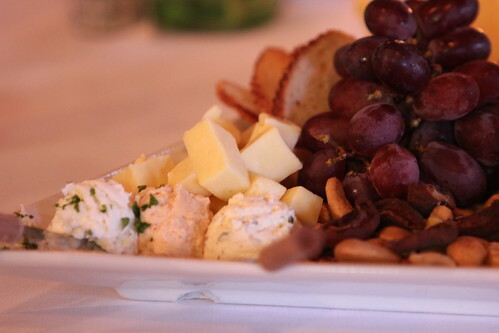 With so much emphasis on dairy products, it should come as no surprise that dinner started with the larger version of the Blue Ribbon Cheese Plate. Brimming with a variety of cheese, fruits, and nuts, there was plenty to go around. 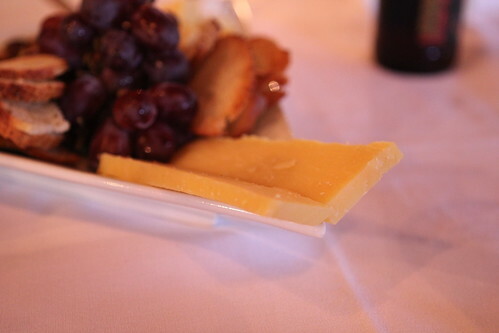 I usually associate the cheese plate with the dessert section of the menu, but after trying the house raw milk cheddar, I was in no mood to complain. This was smooth & satisfying cheese with a welcome subtle tanginess. The other house raw cheese was a gouda and I rarely encounter a Gouda with this much kick. It wasn’t overpowering but enough to quickly make it one of my favorites. 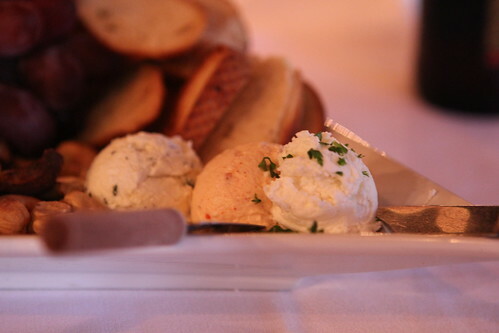 At this point my memory and notes get a little hazy but working from right to left was a beautifully smooth & tart goat cheese, a spicy fromage with a big, peppery taste that lingered just long enough, and an herb cheese that was strangely reminiscent of boursin. Having just left the sweltering confines of a Southern summer, I wasn’t prepared for the last cold front to hit Indiana. By the time we left Traders Point, temperatures had dropped to the low 50s and something warming was in order. Enter a cup of the chicken and rice vegetable soup. 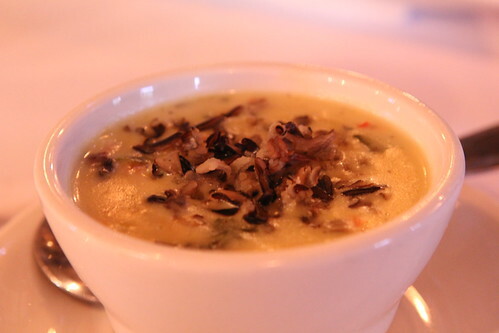 This small cup of soup was just what I needed as the rich, creamy broth was warming to the core. True there wasn’t very much chicken in the bowl, but with a full compliment of hearty vegetables and rich, unctuous broth, it wasn’t that badly missed. 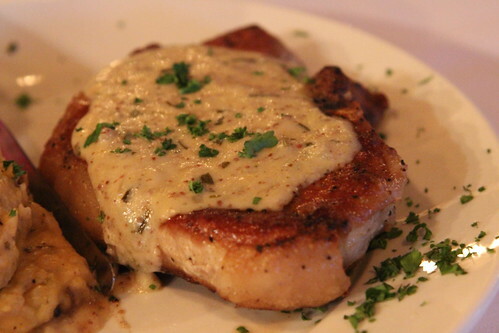 When it came to choosing an entrée, I found myself stuck in a happy situation. There were simply too many things that I wanted to try, namely the Famous Farm Burger. Made from 100% grassfed beef, I was a little miffed when they couldn’t tell me what cuts went into the burger, but there’s nothing wrong with using all the trimmings. Still, I was looking for something more than four ounces of ground beef, so I went with the more substantially named Pork Porterhouse. Served with a white wine tarragon mustard sauce and a side of cheesy mashed potatoes, this was meat and potatoes taken to a higher level. I don’t want to think how much cream and butter went into these potatoes but I will focus on the addition of the house spicy fromage. 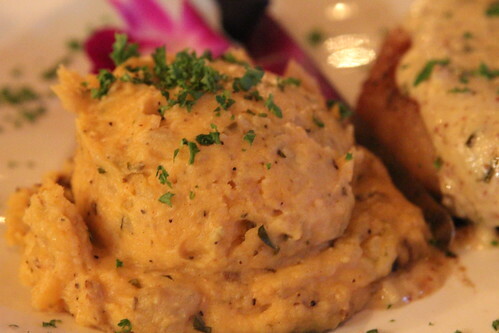 It was the inclusion of that cheese that really gave these potatoes the leg up. Each forkful was rife with the creamy richness that you expect from good mashed potatoes but the addition of a touch of spice made these some of the best potatoes I’ve ever had. 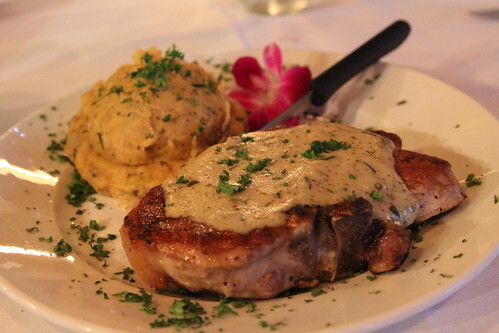 All that fawning over the potatoes doesn’t mean the pork porterhouse was worthless, quite the contrary. Beautifully seared, this porterhouse was worth the wait. I will admit that it suffers a few of the problems that plague large cuts of meat. A few pieces, especially on the edge, were a little dry but the robust flavors of the mustard sauce more than made up for those shortcomings. I wouldn’t hesitate to order this again. At this point in the meal, the three of us were ready to be rolled down the stairs and out to the parking lot, but would it really be fair to come to Traders Point Creamery and not try any of their ice cream? 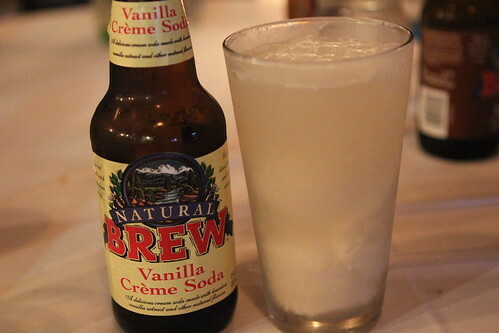 I’ve never had a cream soda float before but with the combination of Traders Point vanilla ice cream and Natural Brew vanilla crème soda, I saw a new favorite in the making. 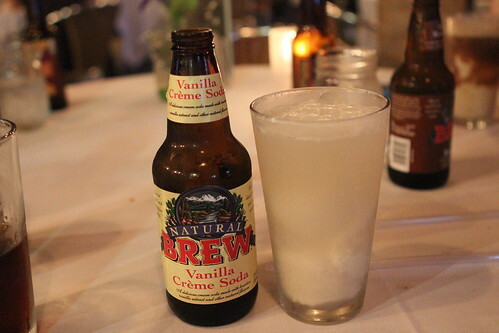 Some might say that mixing vanilla crème soda and vanilla ice cream might be a crème and vanilla overload, I say that’s complete hogwash. Yes, this was an obscenely rich dessert but with each spoonful and straw full of soda and ice cream, I was on a vanilla laced cream cloud. Lacking any sense of restraint, we even ordered a Almond Toffee Crumble Sundae to go. Fortunately, that didn’t emerge from the freezer until Monday morning. 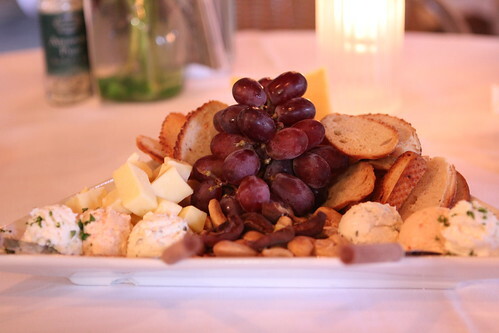 More to the point, what else did we take away from our meal at The Loft at Traders Point Creamery? First, any worries about this farm side restaurant being an all organic, grass fed show and no go were completely forgotten. Second, I would hate to be lactose intolerant. Third, outside of a few long waits between courses, dinner at The Loft was an exercise in everything delicious from Indiana. The meats were local, as were the cheeses and the vegetables, the only thing really foreign was the odd presence of Guinness on the beer list. If an out of state beer is the biggest fault I can find with The Loft, then they’re pretty damn golden. Needless to say, dinner at The Loft was a welcome introduction to Indianapolis outside of buffalo wings. I’m just ashamed I waited this long to explore. Great review, I love the pictures and detailed descriptions. I too was miffed that they don't know what goes into the burgers.. I would think they grind their own. I was a bit suprised to see a flower on your plate though... that's a bit weird amirite? 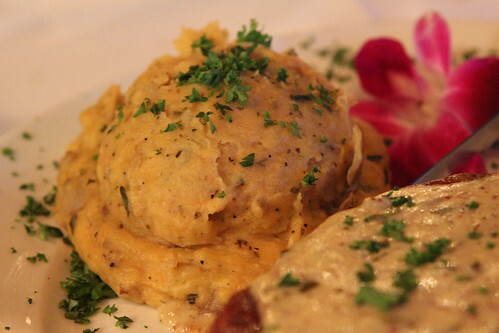 If you ever find yourself in Indianapolis again check out Plum's Upper Room on Zionsville's main street. It is a wine bar/restaurant similar to the Loft that serves perfectly cooked cuts of meat and fish, pretty decent cheeseboards, scallops and pizza. That's it for my shameless plug, we've got a great alcohol selection too!